Being a bridesmaid is a tremendous honor, and I don’t know too many women who would turn down the opportunity. Depending on how close you are to the bride and groom, it’s a wonderful and fun experience to be a part of the wedding party. Unfortunately, no one tells you how expensive it can be to be a bridesmaid. Between the dress, the wedding gift, and multiple outings and events, the price starts to add up quickly, and that’s not even including the cost of travel if the wedding is out of town. One event you usually spend a good chunk of change on is the bridal shower. However, you don’t have to spend a fortune to throw the bride a wonderful party. Instead, follow these easy tips and tricks to throw a beautiful shower on a budget. One of the biggest expenses for any event is often the venue. Where you choose to host the bridal shower can either save you tons or cost you a small fortune. Instead of spending half your budget on a fancy space, consider hosting the party at your own home. If the affair is out of town or your space isn’t bigger enough, consider other options. Maybe the bride’s parents or soon-to-be in-laws would allow you to use their home. Another option is to ask around the wedding party, as someone else may have space. If you go this option, just be sure to purchase a small thank you gift for the host! Before you go out and purchase expensive paper invites, explore other options. Guests are already going to receive paper “save the dates” and wedding invites. The bridal shower, however, tends to be a less formal event and therefore doesn’t necessarily require you to spend lots on the invitations. If you’d like to create free invites, you can create a Facebook event or send out an e-vite. You may have some people on the guest list who aren’t exactly internet savvy. In that case, browse online for inexpensive companies or purchase blank party invitations from a card store that you can customize yourself. Moreover, if you happen to be on the crafty side, you can always make the invites yourself. Food is another expense that tends to rack up the price of any party rather quickly. Most of the time, the bridal party plans the shower together. If that’s the case, create a menu and split up the food among the bridesmaids; have everyone contribute by cooking or baking something for the party. Furthermore, keep the food simple. Don’t try to feed everyone a three-course meal, either. Stick with finger foods, dips and hor d’oeuvres instead. And if you really want to feed everyone an actual meal, make the shower a potluck. To be perfectly honest, in most cases, I’d skip the party favors. More often than not, party favors are small, cheap items that most people won’t ever use. However, if you or another bridesmaid insist on having them, go for easy but great options. If you’re creative you can always create cute and inexpensive items like sugar scrubs, manicure kits, or cute Team Bride glasses. A great idea is to combine the entertainment with the favors and have guests make their own as well! Another option is to shop places like Target’s dollar section for budget favors. It has inexpensive but useful things that every guest would love. While party supply stores have no shortage of decorations such as Bride-to-be banners, streamers, centerpieces, garlands and balloons, you’ll often end up spending more than you planned. For more decoration information, view these miami beach signs. Browse online for cheap party supplies or find tons of DIY décor ideas that are usually quick, easy, and less expensive than already-made decorations. Furthermore, try to utilize items around your home. If your shower has a theme, look around your house for items you may already own that could be of use. You can use strings of old-fashioned Christmas lights to add ambiance, use flowers and plants as centerpieces, and maybe even use some holiday décor depending on the time of year. It’s also worth asking your fellow bridesmaids to bring contributions so you have more to work with at a fraction of the cost. You shouldn’t spend any money, or at least very little, when it comes to organizing the games. Again, utilize Pinterest and the internet to come up with fun and entertaining games everyone will enjoy. Create a groom trivia game for the bride (and likewise one about the bride for guests), play pass the bouquet from gift ribbons and have a wedding dress competition with toilet paper. You don’t need a ton of games for the shower; select a few fun ones and then allow the guests to mingle and enjoy themselves for the rest of the party. There’s no need to pay for an expensive and fancy cake from a bakery for the bridal shower; after all, that’s what the actual wedding is for. Instead, purchase or bake lots of cupcakes for guests to enjoy. The bonus with cupcakes is that you can even arrange them to look like a wedding a dress. Another option is to buy a grocery store sheet cake and dress it up. Of course, no one said there had to be cake, either. See if the bride has a favorite dessert that would be less expensive than cake or consider frosted sugar cookies as well. When it comes to dessert your options are endless. Throwing a bridal shower doesn’t have to be a stressful or expensive affair. Sometimes the simpler events turn out more elegant and fun anyway. 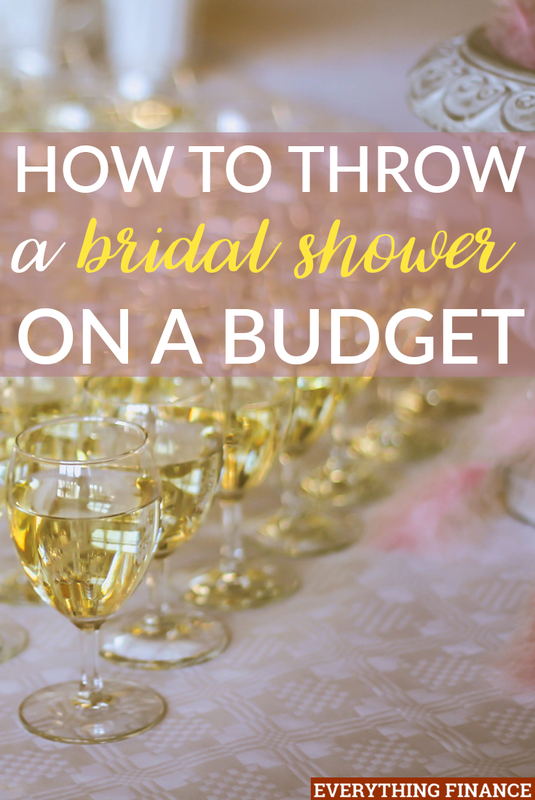 Keep every aspect of the shower fun and simple and be sure to enlist the help of your fellow bridesmaids. In the end, guests will have fun being together and the bride will be glad to have loved ones around her during this special time. Have you ever thrown a bridal shower? How did you keep it budget friendly?